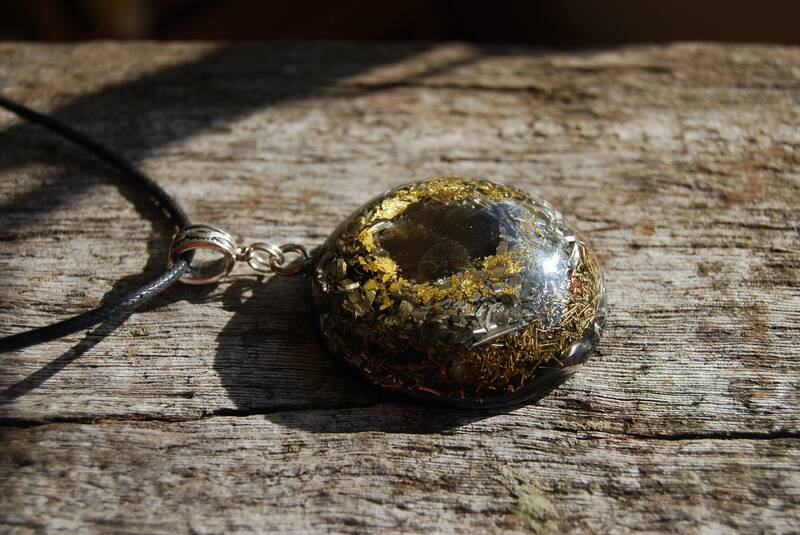 This lovely 4.6 cm / 1.8" in diameter orgone pendant is made out of lots of brass, bronze, aluminium and copper shavings and it has some pure 24K leaf Gold. 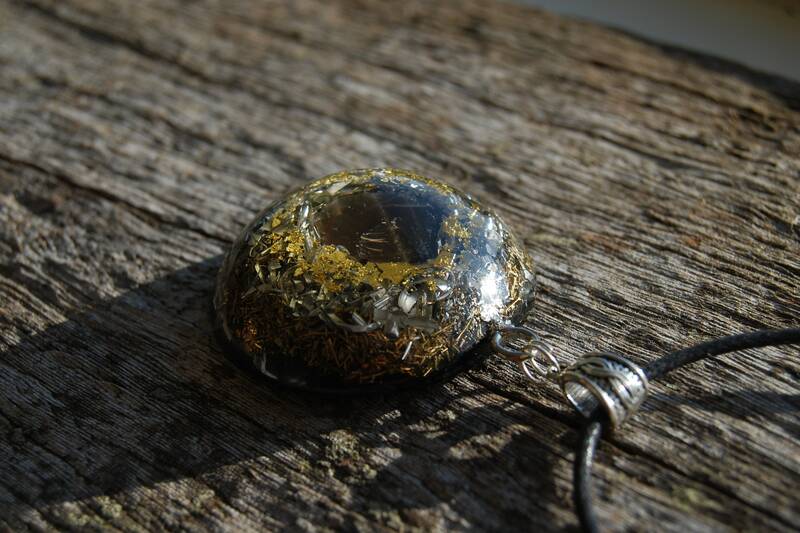 It is based on the 50/50 ratio (50% metal/50% resin - the more metal shavings, the better) which is required for the orgonite® to properly work according to William Reich's research. 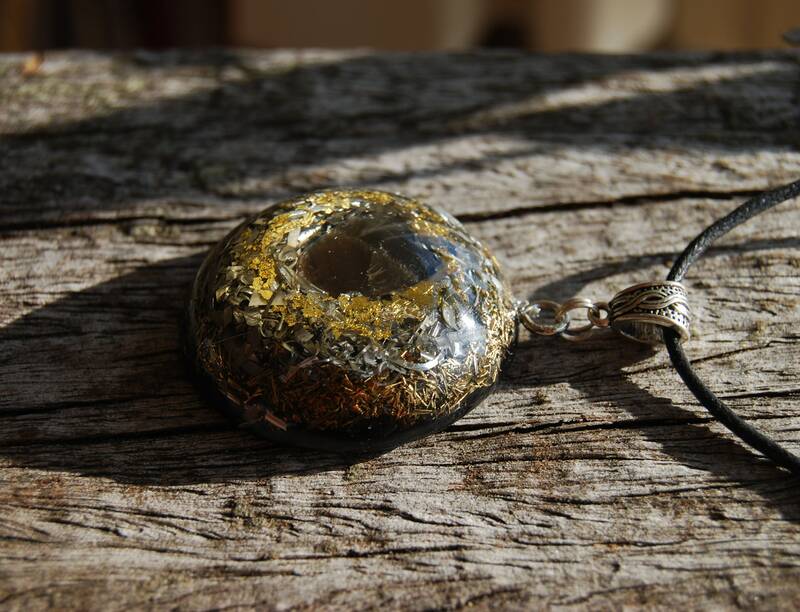 The main stone is a big natural untreated Smokey Quartz in the front. 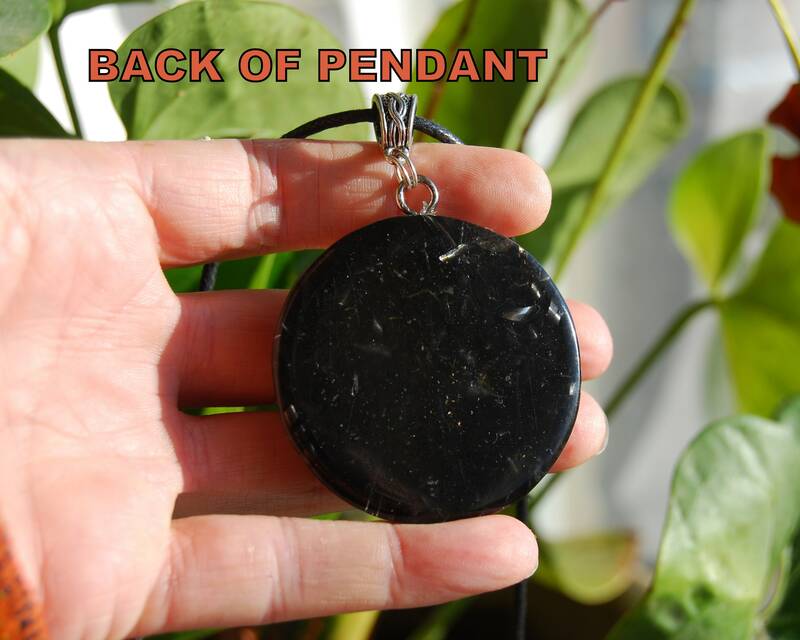 It furthermore contains Rose Quartz (self - love), Pyrite (to enhance and protect - it deflects extremely low frequencies), black Tourmaline (to protect and ground excess energy), Rhodizite (to amplify), Selenite (to clean and charge), and clear quartz (for piezo-electric effect) all within a durable resin setting. 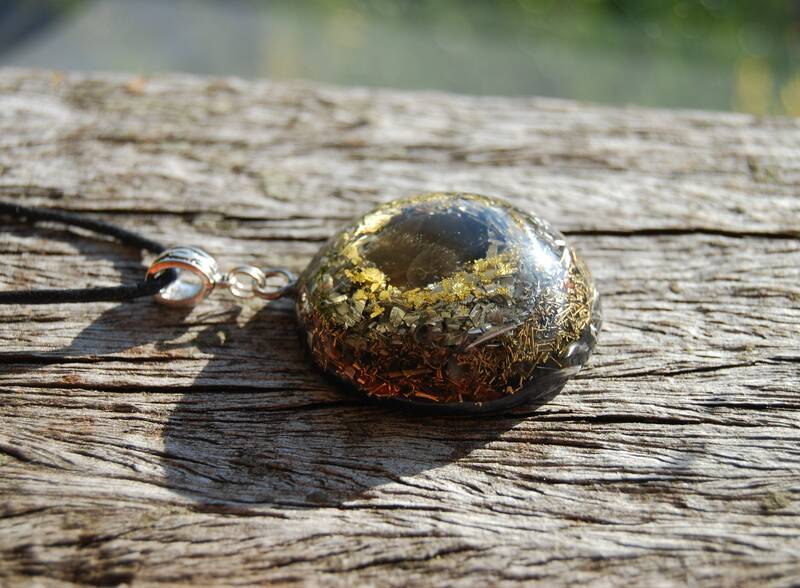 Smoky Quartz is an earthy, grounded stone that will bring emotional calmness, lift depression and elevating one’s mood. This quartz is able to take negative emotions and transform them into positive energies; relieving fear, jealousy, anger, stress and bringing comfort, security, serenity and relaxation as well as grounded centering. Smoky Quartz teaches one how leave behind what no longer serves us well, offering a great deal of assistance dealing with and relieving grief. Bringing emotional calmness. 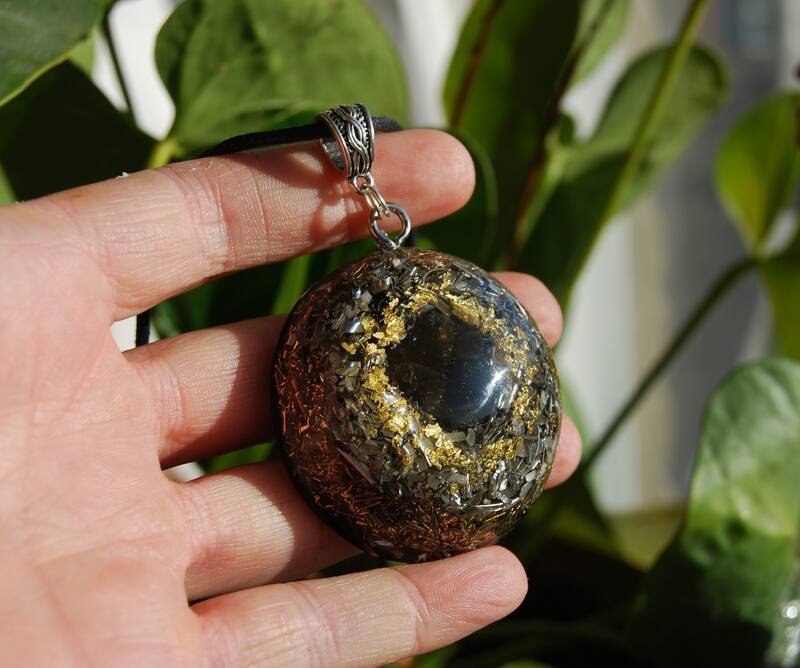 Enhancing one’s survival instincts, Smoky Quartz it will assist one not only in daily existence but with reaching business goals, engendering cooperation from others, prioritizing wants, needs and even granting wishes. Bringing prosperity, abundance and general good luck. 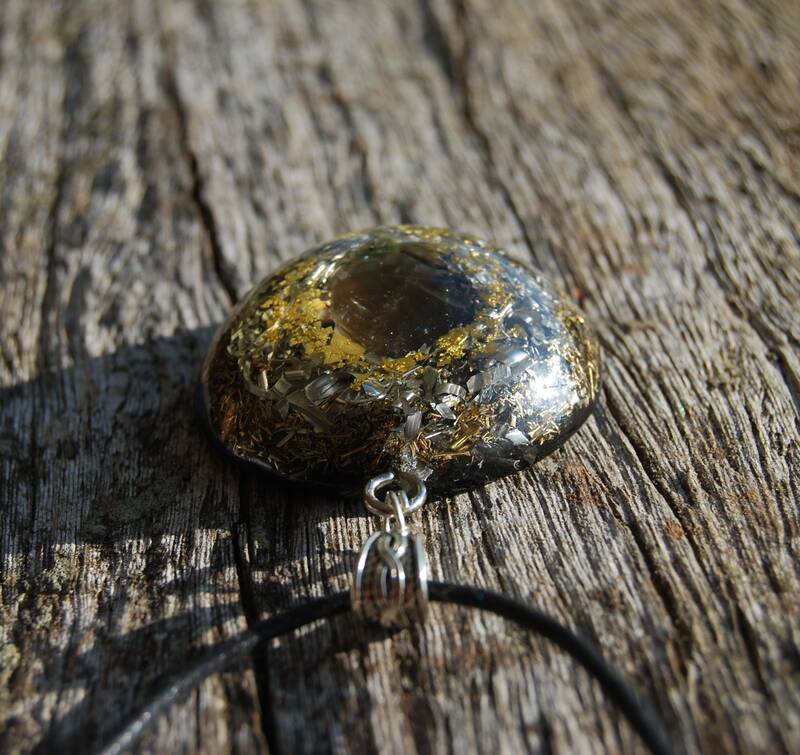 Pyrite makes a wonderful energy shield, blocking / deflecting out negativity from various sources such as (ELF) extremely low frequencies.